Adanson's jumping spider has eight eyes, but the way they're put together doesn't actually seem that useful for, well, seeing things. These spiders use a previously unknown trick to judge their surrounds and leap great distances...all thanks to blurry vision. Most animals, humans included, rely on two eyes with overlapping fields of vision to judge depth perception - the brain simply compares the two sets of visual data and uses that to figure out how far away various objects are. There are a few methods that other animals employ when their eyes don't overlap - chameleons, for instance, can play around with the lens of the eye to bring an object in and out of focus, revealing its distance. This particular spider is able to live pretty much anywhere and moves around constantly, which makes the fact that we didn't know how it judges distance all the more astonishing. Adanson's jumping spider can judge distances accurately even when all but its main pair of eyes are covered, and those eyes don't overlap and can't change their focus. In order for these spiders to survive, let alone thrive, they must have a retinal structure unlike anything we've ever seen. The same is true of the Adanson's house jumper's principal eyes. That means the blurry image on the second layer contrasts with the sharply focused image on the layer below. As the spider closes in on its prey, the defocused image will get blurrier still, allowing the spider to gauge the distance. Koyanagi confirmed that this is how the spiders work by testing them under pure green and pure red lights. Under red light, the total absence of green should trick the spiders' perception of its defocused images, making all objects seem closer than they are, so the spiders' jumps should fall short. That was exactly what happened. We've never observed this sort of bizarre retinal structure before, though the researchers think it's likely that all other jumping spiders have a similar setup. So, good for the jumping spiders for coming up with a way to put bad eyesight to good use - though I'd strongly advise against those of us who need glasses trying to replicate their success. Science via New Scientist. 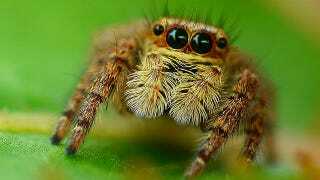 Image of jumping spider by coniferconifer on Flickr.